After over one year on the SCD (specific carbohydrate diet), I decided to officially try something on the illegal foods list. It’s something that I’ve been dying to try and have yet to understand why it’s an SCD-illegal food … unsweetened cocoa powder. I know of others who adhere to the SCD, but have tried cocoa powder and felt fine, and since it’s been over one year for me, I thought I’d try too. If you’re lost on what I’m talking about because you haven’t read my ‘About Me’ or health story (links to my health story are listed in ‘About Me’), I suggest you go check it out. If not, just roll with the punches. I got the idea for these brownies from my boss. 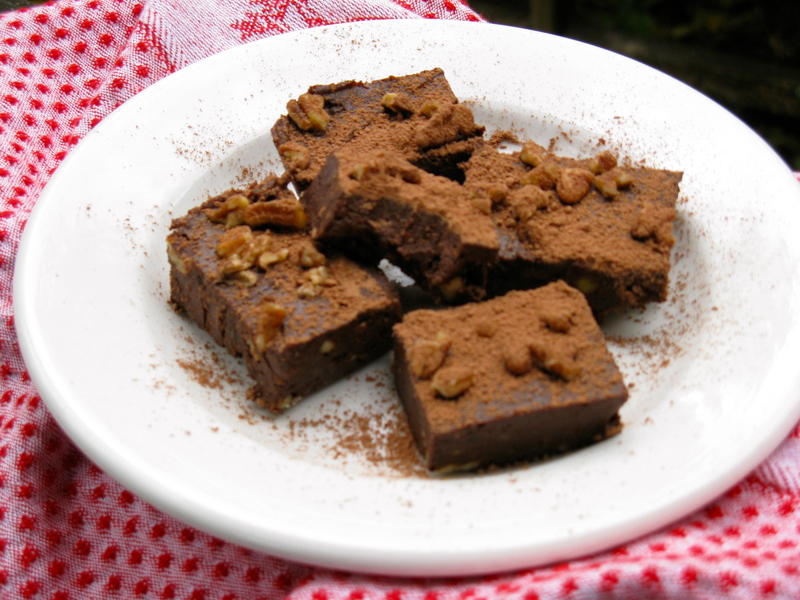 Last week, she brought in a batch of raw brownies that she made and shared them with others at the gym. She apologized that I couldn’t try one because she said she added oats to the recipe to cut back on the amount of nuts. She said the oats were the only ingredient that I wouldn’t be able to have, and that these can be made without. So, I took it upon myself to check out her recipe and make it my own (note: she’s also a food blogger and creates some beautiful dishes; beautiful photography too). The result? Fudgy, bittersweet, nutty and moist. So far, so good on the cocoa test too, but I’m not pushing it. I don’t eat more than two tiny pieces a day and understand that symptoms can take up to four days to set in, so I’m definitely paying attention to how I feel (though I generally do anyway). Again though, I’m not too worried about cocoa powder. It seems pretty harmless, which is why I decided to try it. I don’t plan on trying any other SCD-illegal foods anytime soon and to be honest, I’m scared of trying things like yams/sweet potatoes, turnips, plantains, etc. All that starch kinda terrifies me and the potential hazards it could cause in my GI tract. I’m happy to continue staying away from such foods for a while still. Place 1 cup pecans in the food processor and blend until mixture is finely ground. Next, add the dates and pulse until dates are broken up and somewhat combined with the pecan flour. Add the avocado, vanilla, sea salt and cocoa powder. Blend well until all ingredients are mixed together. The mixture will be very thick and sticky. Scrape mixture into a large bowl and mix in the remaining 1/4 cup pecans. Pat mixture into a small pan (I used a 5×7 Pyrex dish, an 8×8 pan works too). Sprinkle and pat down additional pecan pieces on top, if desired. Place in the refrigerator or freezer until ready to set. This will make it easier to slice the brownies. Serve with a dusting of cocoa powder, if desired. Holy yum!! I caved and bought a bunch of paleo baking goodies!! Almond flour, coconut flour, and coconut oil, you can bet I will be back to your site this weekend baking up some of your treats!!! Haha, nice! Have fun and don’t go overboard all at once! Just tried these. They’re amazing! I added some unsweetened coconut to the top. Next time I make, I plan to add some cinnamon and chopped cherries. Thanks so much! Was searching a long time for a flourless, sugarless, dairy-free recipe! These were really tasty–I went grain free/gluten free for Lent and was looking for something chocolate and these filled the bill–just did not tell family the entire ingredients list 😛 Thanks for posting it. Thanks, Nettie! I’m glad these satisfied your craving. Also, good for you for trying out gluten/grain-free. Hopefully, you’ll feel and notice the benefits and want to continue when Lent is over. I’ve got lots of recipes here, so be sure to check them out for ideas!